This MicroCT image shows a massive snapping claw of Alpheus galapagensis, which features a cocking pivot joint. The claw has a distinctive plunger and socket system for jetting water to create cavitation bubbles. The researchers used Imaris to create Surfaces that helped them visualize the joint structure. Photo credit: Tomonari Kaji. Some species of shrimp have evolved the amazing ability to create a loud snapping sound by closing their claws in less than 1 millisecond. The sound occurs because jetted water creates a cavitation bubble that makes the snapping sound when the bubble collapses. 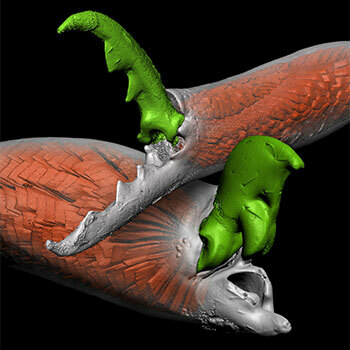 Tomonari Kaji and colleagues at the University of Alberta in Canada are using a variety of experimental and imaging analysis approaches to find out how these snapping claws evolved. The extreme movements of the snapping claws require both a mechanism that stores energy much like a spring and a latching mechanism to release this energy very quickly. The snapping claws are an evolutionary puzzle because a claw either closes fast enough to create a cavitation bubble or it doesn’t. This means that the claws must have evolved the ability to snap suddenly rather than gradually. To find out how the simple pinching claws found in most shrimp independently evolved into snapping claws in Alpheidae and Palaemonidae shrimp families, the researchers analyzed claws in 114 species from 19 shrimp families. Their study combined advanced imaging methods and Imaris analysis with 3D printing and mechanical experiments. 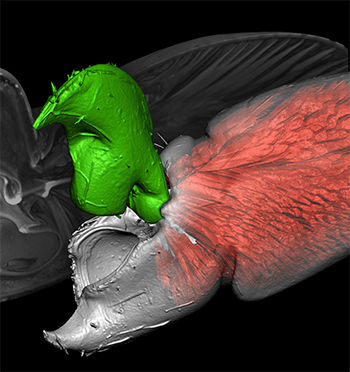 Using microCT, the researchers imaged shrimp claws from each species included in the study. With Imaris, they created Surfaces for each morphological unit (exoskeleton, muscles, etc) to help them visualize the joint structure and the claw’s configurations in three dimensions. This analysis revealed two new types of shrimp claw-joints that likely preceded the snapping capability by allowing claws to close more quickly: the slipjoint and cocking slipjoint. These MicroCT images show interlocking snapping claws of Synalpheus dardeaui, a member of the Alpheidae family, and Harpiliopsis depressa, a member of the Palaemonidae family. Both species exhibit slip joints. Photo credit: Tomonari Kaji. To confirm how the slipjoints worked, the researchers used 3D printing to create 3D models that would also help them understand how the muscle that closes the claw was involved in cocking and energy storage. The researchers used Imaris for segmenting the microCT images because it provided an easy way to create the 3D Ssurfaces needed for 3D printing. The researchers began by using the Imaris mask function to separate the volumes according to morphological units. They then used the software’s isosurface Surfaces function to create the isosurfaces for 3D printing and exported this data as STL files. Mechanical experiments using the 3D models revealed that cocking slipjoints facilitate ultra-fast closing, and eventually evolved the ability to ‘snap’ (break water by creating a cavitation bubble) because this type of joint allowed energy to be stored before the claw starts to close. Overall, the study showed that key functional transitions between simple pinching and snapping claws were achieved with very small differences in joint structure. The researchers say that subtle changes appeared to have facilitated a completely new functional change in an abrupt manner. As a next step, the researchers will grow shrimp under different claw-use regimes to test whether enhanced usage of claws for jetting/snapping leads to enhanced claw performance via developmental plasticity. They plan to use Imaris to analyze images of the claws from the different treatment groups at the end of the experiment. Research Paper: Kaji T, Anker A, Wirkner CS, Palmer AR. 2018. Parallel Saltational Evolution of Ultrafast Movements in Snapping Shrimp Claws. Curr Biol. 2018 Jan 8;28(1):106-113.e4.